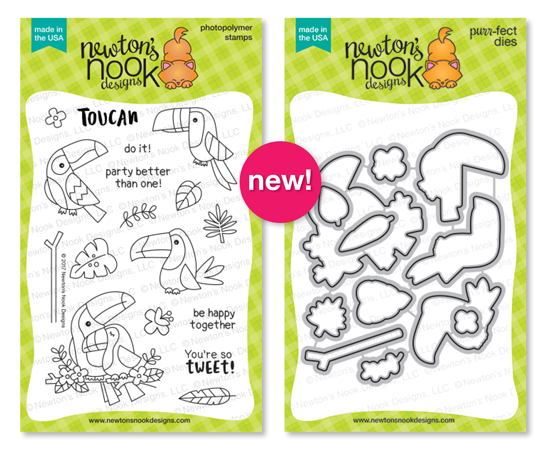 Hello, everyone It's Day three of the Newton's Nook July Release and Anniversary celebration and today we are sharing the new set Toucan Party and it's coordinating die set. I created a Fun card using the new Tropical Leaves stencil as an embossed background. I dry embossed the stencils using my Big Shot machine and then I trimmed the cardstock and layered it onto a Black card base. I stamped the Toucan image onto some White cardstock and then die cut it into a Circle. I colored the images in with some Copic Markers. Then I added it to the card front with some foam tape. I stamped the sentiment onto a strip of White Cardstock and then I trimmed it into a banner and added some Green twine. I adhered it along the edge of the card and then I added some Green enamel dots for an extra Pop of color... This is such a Cute set!! Comment on the NND blog and Design Team blogs (see list below)! The winner will be chosen at random from the collective reveal posts. Make sure to check out each of their blogs and comment for your chance to win. You will not know which blog has been chosen so the more you comment on the better your chances are of winning! You have until Thursday, July 13th at 9pm CST to comment -- winners will be announced on the blog post on Friday, July 16th. Love your coloring on your gorgeous card. Love the way you made your beaks look so shimmery, like the sun is shining on them!! 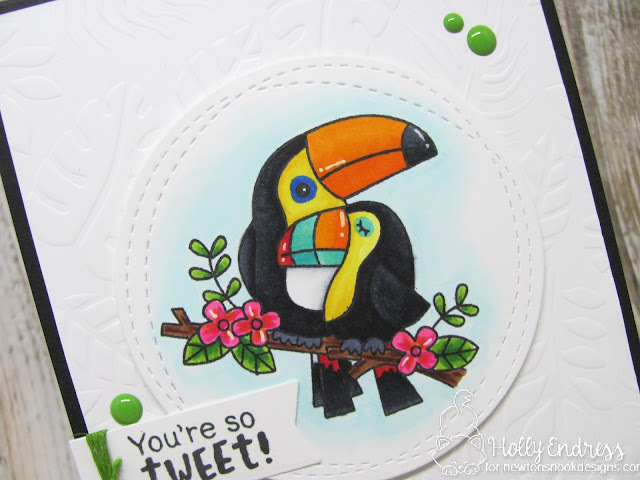 Gorgeous card - I love that toucan. 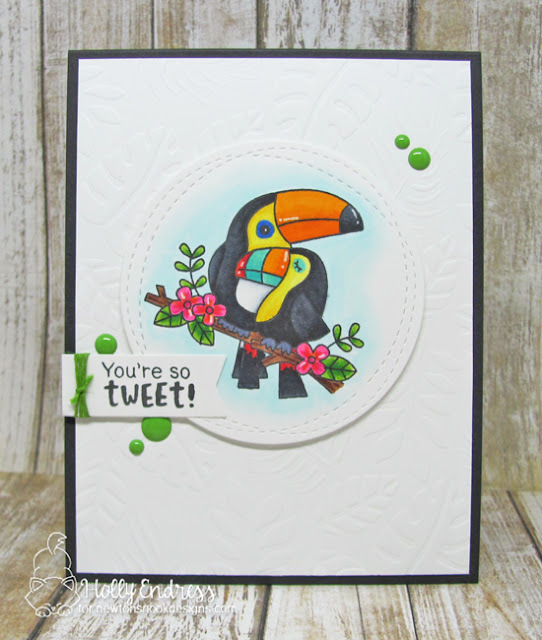 LOVE this fun tropical toucan! Great color and design! Wow! I've never dry embossed with a stencil, great idea. The toucans looks so sweet together. This is such a sweet image I love how these two toucans are cuddling together. Fabulous coloring and I like the circle design. This is such a darling set and so is your card. How charming! What a fun card, Holly! Awesome use of the stencil, and I love your coloring of those toucans! Love your dry embossed background.Super card. I am in love with toucans. 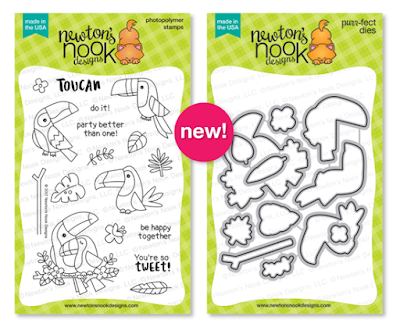 I love the embossed stencil with this adorable pair of toucans! Love that embossed background and the way you have used the new set - so pretty! This is such a Tweet card, love it!! Beautiful. Love how you dry embossed the background. I just love how you dry embossed the stencil! I always forget to do that so thanks for the reminder. Adorable card ! Such a sweet card! It's beautiful and full of love. I really like the embossing on this card. It gives the card an elegant touch. What a sweet toucan card and love hos the stamp is the focal point!